On October 2, 1984, in Kansas City, in Game One of the American League Championship Series, Larry Herndon led off the fourth inning with a home run off Bud Black to put the Tigers up 3-0 in a game they eventually won, 8-1. After the game, a group of writers waited in the clubhouse to interview him. They had already spoken to Alan Trammell and Lance Parrish, who had also homered. They’d spoken with winning pitcher Jack Morris, and with Willie Hernandez, who closed out the game with two scoreless innings. “All I remember is waiting, waiting for him to come back to the clubhouse so we could interview him. ... [Eventually] Dan Ewald (Detroit’s PR man) let me back to the shower where Herndon was staying under the showerhead as long as he could, probably in hopes that the media would get tired of waiting and go away. “He had somebody bring him his clothes and went out the back way. I relayed the message to everybody else. Larry Herndon was born on November 3, 1953, in Sunflower, Mississippi. He spent most of his youth and teenage years in Memphis, Tennessee, where he graduated from Douglass High School at the age of 17. “I’m a lucky man. ... I had great sisters and brothers and was raised by my grandmother, Estella,” Herndon told MLB.com’s Rich Draper in February 2005. “You know how grandmas are. She taught me how to live the right way and the Golden Rule. ... I grew up in the South, but I never had racial problems. [Herndon is an African-American.] You can always find something if you dig deep enough. But if you don’t argue with somebody, there’s no argument. Owing largely no doubt to his shyness and avoidance of the spotlight, very little information is available to the public regarding Herndon’s “great” sisters and brothers, the circumstances that led to his being raised by his grandmother, or even at what age he moved to the Douglass neighborhood in Memphis. But it is obvious that his early life could not have been easy. Douglass was a community formed in the 19th century when William Rush-Plummer, the son of a white slaveholder and a slave from Africa, was granted 40 acres by his father when his family was released from slavery. The neighborhood borders the towns of Hyde Park and Hollywood and is surrounded on three sides by railroad tracks. Rush-Plummer, who went on to become an ordained minister, named the neighborhood after his hero, the abolitionist Frederick Douglass. Douglass High School, which Herndon attended, and where he won several letters for athletic achievement, was opened in 1946. It was closed in 1981 when attendance plummeted because of crosstown busing aimed at desegregating the Memphis schools. Many blacks from the Douglass neighborhood elected to attend other schools, but few white students reciprocated. It later reopened. During his years at Douglass, Herndon played baseball well enough to catch the eye of St. Louis Cardinals scout Buddy Lewis, who caught briefly for the Cardinals and the Boston Braves. Lewis, a longtime resident of Memphis, liked what he saw well enough to persuade the Cardinals to draft Herndon in the third round of the June 1971 draft (54th overall) even though he was only 17 years old. Herndon signed with St. Louis, which immediately assigned him to their Gulf Coast League Rookie team, where he batted .239 in 40 games in 1971. In 1972 he played for three teams, topping out with the Cedar Rapids team in the Class A Midwest League, accruing only 162 at-bats with all three teams and batting just .241. In neither season had he shown any power. In 1973 Herndon finally got some serious playing time, logging 485 at-bats, batting .287 and hitting his first three professional home runs for the Cardinals’ St. Petersburg team in the Florida State League, another Class A outfit. At the age of 19, he had finally hit his stride. The following year Herndon played for Arkansas in the Double-A Texas League, batting .285 with 16 doubles, 10 triples, and two homers, finally beginning to show some power. This display earned him his first call-up to the major leagues. 12-G 1-AB 1-H 1.000-BA 0-RBI 3-R -- indicating that he was used primarily as a pinch-runner and a defensive replacement in center field. In so doing Herndon had embarked on a major-league career that wouldn’t be over for another 14 years, though he was not quite done with the minor leagues yet. He started the 1975 season with Tulsa, St Louis’s Triple-A affiliate. Three-quarters of the way through the season, the Cardinals traded him, along with minor-league left-handed pitcher Luis “Tony” Gonzalez, to the San Francisco Giants for starter Ron Bryant. Finishing the season with the Giants’ Phoenix team in the Pacific Coast League, Herndon compiled a season total of .264 with 11 doubles, four triples, three home runs, and an eye-popping 29 stolen bases. In 1976 Herndon played the last 14 games of his minor-league career with Phoenix. He batted only .246 in 57 at-bats, but his speed and defense were quite attractive to a team that had recently traded center fielder Garry Maddox to the Philadelphia Phillies. After his call-up by the Giants, Herndon appeared in 115 games, most of them in center field. He batted .288 with a .356 slugging percentage and scored 42 runs while stealing 12 bases. It was a performance sufficient to net him The Sporting News’ Rookie of the Year Award, and to get him named to an outfield position on the annual Topps All Star Rookie team. He was 22 years old. In 1977 Herndon was hampered by injuries, limiting him to 49 games and a .239 batting average, but he was able to bounce back strongly in 1978, batting .259 in 151 games and helping San Francisco to an 89-73 record under manager Joe Altobelli. This was also the year in which he married his wife, Faye. It’s safe to say 1979 and 1980 were nearly identical seasons for Herndon, as he batted .257 and .258, respectively, with .384 and .385 slugging percentages. One year 132 games, the next 139. In both years he played 122 games in the outfield. Such consistency would have been marvelous had the numbers been just a bit better or had the team been steadily improving during his tenure, but the numbers were not great, and the Giants were floundering, winning only 71 and 75 games those two years. To add insult to injury, Herndon suffered through an unusually embarrassing inning on September 6, 1980: he made three errors in one inning, on three separate plays. Such an event is slightly rarer than an unassisted triple play, but it’s not something ballplayers brag about. By now Herndon was 26 years old and nine years into his pro career. But rather than stall out professionally, he batted .288 in 1981 and lifted his slugging average to .415, both personal highs. He played in 96 of the Giants’ 111 games during that strike-shortened season. En route Herndon impressed people enough to win the second annual Willie Mac Award, named for Giants great Willie McCovey, for spirit and leadership. The inaugural award had gone to Jack Clark in 1980. It is unusual for such awards, even those claiming to reward intangibles, to be delivered to quiet men who do not hit for power. Perhaps the voters saw what was to come. Unfortunately for the Giants, the front office didn’t. They traded Herndon to Detroit for pitchers Mike Chris and Dan Schatzeder on December 9, 1981. In Detroit Herndon was joining an organization that hadn’t made it to the postseason since 1972. Sparky Anderson had taken over as manager during the 1979 season, and the team had played reasonably well for him, but he had been unable to bring them home any higher than fourth place in the tough American League East. While 1982 proved no different in that regard, it was a breakthrough year for Herndon. During one two-week stretch in May, he batted .440. On May 17 he hit a home run in his final at-bat of the game. The next day, he hit home runs in each of his first three trips to the plate. On May 20 he recorded a five-hit game, with two triples. Not surprisingly, on May 23 he was named the American League Player of the Week. Larry Herndon had arrived, finally living up to the expectations that had been put upon him. He closed out the season with a .292 average, 23 home runs, 88 RBIs, 92 runs scored, and a .480 slugging average, all personal highs. In 1983 Herndon came very close to duplicating those numbers, batting .302 with 20 home runs while flip-flopping his run and RBI totals. His slugging average that year was .478, and he even managed to rap out another five-hit game, on July 11, slugging two doubles and a home run, driving in three runs and scoring four. The big change that year, however, was visible in the team’s record. They had won 92 games to finish only six games behind the world champion Baltimore Orioles. Sparky Anderson had finally put together the pieces he felt he needed to take the Tigers to the next level -- the promised land of the postseason -- and one of those important pieces was his left fielder, Larry Herndon, who had clearly come into his own under Sparky’s leadership. In some ways 1984 must have been difficult for Herndon. At 30 he was one of the veterans on an otherwise young team. Only Dave Bergman (31), Milt Wilcox (34), and Darrell Evans (37) were older. Herndon was entering his 14th season as a professional ballplayer, and both his personal and his team’s expectations were higher than they had ever been. The Tigers got off to a great start, taking their first nine games and 35 of their first 40, but Herndon struggled. For the season he managed to get into only 125 games, losing playing time principally to Ruppert Jones and Johnny Grubb, although Barbaro Garbey, Dave Bergman, and Rod Allen got into games in left. Herndon managed an end-of-the-season surge to push his batting average to .280, but the surge had little punch to it. His slugging average for the season dipped to .400. He hit only seven home runs, and his RBI total dropped to 43. When the playoffs arrived, Herndon found himself in the lineup in Kansas City for Game One. Leading off the fourth inning with his team up 2-0, he hit the home run that he did not want to talk about after the game. His team took the next two games, 5-3 and 1-0, but he didn’t start in either game. The World Series started in San Diego on October 9, and Herndon was back in the lineup. In the fifth inning he came up with a runner on and his team down by a score of 2-1. He homered, giving Jack Morris and his teammates a lead they did not relinquish. One has to wonder, since the Padres won Game Two, whether the Tigers would have prevailed had the Series gone back to Detroit with them down by two games. Herndon batted .333 for the Series in 15 at-bats, picking up another RBI along the way. He even made the highlight reel by catching Tony Gwynn’s fly ball to left field for the final out of the Series in Game Five. But Herndon’s career began winding down. His batting averages for 1985 and ’86 dipped to .244 and .247, respectively, and his slugging averages dropped to .384 and .385 -- the same numbers he had recorded playing for San Francisco in 1979 and ’80. His playing time diminished, largely due to his balky knees, and at the end of the 1986 season the Tigers released him, though they re-signed him as a free agent less than a month later. On Opening Day of 1987 Herndon hit a home run off Dennis Rasmussen of the New York Yankees that many fans talked and wrote about for years afterward. Rob Neyer of ESPN.com selected the blast from readers’ submissions as one of the Top Ten Legendary Stories from SportsNation on a site promoting his Big Book of Baseball Legends. There, one fan described it as the hardest-hit ball he had ever witnessed, saying that it hit the façade of the upper deck in straightaway center field 440 feet away. It was the first of nine home runs Herndon hit that year as he boosted his batting average to .324 and slugged .520 while playing 53 games in the outfield and appearing in 23 games as the team’s designated hitter. Herndon’s final home run of the year, however, proved to be among the biggest hits he would ever get. In the final week of the 1987 season the Toronto Blue Jays began frittering away what had been a seemingly safe lead in the American League East Division by losing four straight, leaving them one game ahead of the Tigers as they came to Detroit for the final three games of the season. The Tigers managed to take the division lead by winning the first two games of the weekend -- each by a single run -- meaning that Toronto had to win on the final day to force a tie and a playoff. Frank Tanana took the ball for the Tigers and Jimmy Key pitched for the Jays, and both pitchers were in rare form. The only run scored all day came on Herndon’s solo shot in the second inning, a homer that drifted a few rows into the lower-deck seats in left field, giving Sparky Anderson what turned out to be his last division championship. 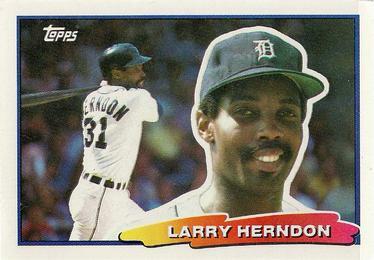 In the 1987 postseason, Herndon collected three hits in nine at-bats, driving in two runs and scoring one, in the Tigers’ five-game loss to the Minnesota Twins in the American League Championship Series. The 1988 season was Herndon’s last as a player. Having been released again only to be re-signed once more by the Tigers during the offseason, he saw his performance plummet. His batting average fell 100 points, to .224, while his slugging average dipped nearly 200 points. After 14 years in the majors, still one month shy of his 35th birthday, Herndon’s playing days were over. His career stats include a .274 batting average, a .409 slugging percentage, 107 home runs, 605 runs, and 550 RBIs. In 1992 Sparky Anderson and the Tigers invited Herndon back as their hitting coach. This surprised Paul Carey, the Tigers longtime radio broadcaster. “I was surprised because Larry rarely spoke his mind aloud. Shyness was his hallmark,” Carey said. “Larry Herndon, my first hitting coach in the big leagues, told me, ‘Every day, you play like a champion. If things aren’t working out where you are, the champions will come get you.’” At the time of the interview Clark was a member of the New York Yankees and was playing in the ALCS. When Herndon came back to the Tigers in 1992, some of his old teammates were still with the team, notably Alan Trammell and Lou Whitaker, but the team struggled to disappointing finishes year after year. In 1998 the Tigers fired Herndon. “I always felt he was a scapegoat,” Carey remembered. For a while Herndon owned a coin-operated laundry, but in 2005 the Tigers came calling again, offering him the position as hitting instructor for the Lakeland Flying Tigers, their affiliate in the Florida State League (Class A Advanced). He accepted the position and as of 2010 was still with the team, offering his special brand of advice to a new generation of Tigers prospects. The announcement of Herndon’s appointment was covered by Rich Draper for MLB.com. Draper got Herndon to acknowledge that “it’s a great honor to be invited back.” Of course, first he talked about his daughter Myia, who was graduating from Thomas Cooley Law School in Lansing, Michigan. “I’m very proud of her. It’s a big, BIG day,” he said. And he talked about his other three children: Larry Jr., Latasha, and Kamelah. He talked about his “four grandbabies,” his wife, Faye, and his grandmother Estella who had raised him. Other than his references to his debt of gratitude to the black players who had preceded him, all of the baseball talk in the article relies on Draper himself telling us who Larry Herndon was, and what he did. Larry Herndon wouldn’t tell you about himself. That job was left to others. In 2008 Andy Barkett was named manager of the Lakeland Flying Tigers. Andy was delighted with the hitting coach he inherited. Larry Herndon took that approach, and the results speak for themselves. “There has always been a quietness and sensitivity about Larry Herndon, a black athlete never conflicted about who or what he was, and a man who nurtured a deep love of family, friends and baseball,” MLB.com’s Rich Draper said. Reichler, Joseph L., ed. Macmillan Baseball Encyclopedia, seventh ed. New York: Macmillan & Co. 1989. Draper, Rich. “Herndon Kept Focus On Field.” mlb.com, February 21, 2005. Fordin, Spencer. “Bench Is Strength for Yankees.” mlb.com, October 11, 2004. Vasey, Glen. Correspondence with Andy Barkett, May 2010. Vasey, Glen. Correspondence with Paul Carey, May 2010. Vasey, Glen. Correspondence with Rod Nelson, May 2010. Vasey, Glen. Correspondence with Mark Pattison, May 2010. Vasey, Glen. Correspondence with John Rudak, May 2010. Vasey, Glen. Correspondence with Rich Shook, May 2010. Vasey, Glen. Telephone interview with Andy Barkett, May 29, 2010.